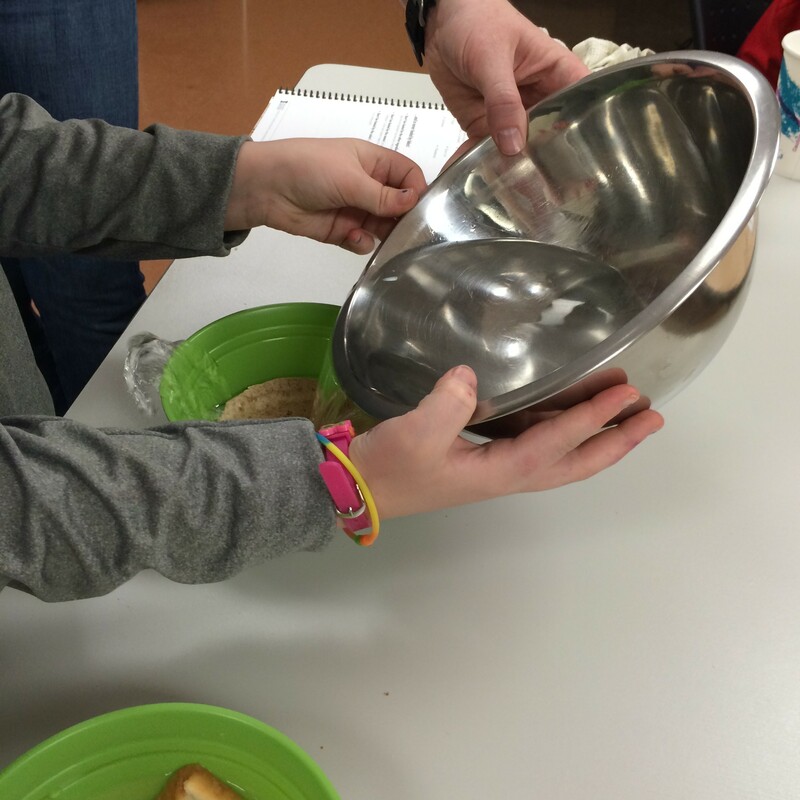 This week our lesson at Cooking Matters is “try it, you’ll like it!” During the lesson we will talk to the kids and their parents about how to develop healthy eating habits, identify whole grains and how to include more vegetables and fruits in every meal. I’m pretty excited about this weeks class because we are doing a taste test with everyone to see if they can identify the difference between canned, frozen and fresh fruits and vegetables, and trying NEW fruits and vegetables. Last week during the introductions, one of the kiddos in class called myself, our fearless leader, Becky, our nutrition guru Kelly, and a rockstar assistant, Lauryn, “the judges”, and he thought that we were going to taste and critique the meal he made. It was really cute. This week he really is going to feel like he is on a cooking tv show when we do the taste test – it will be like Hell’s Kitchen, except loving and fun and not scary! One way to establish healthy eating habits for kids is to make sure that they always have something nutritious to eat in the fridge or pantry and allow them choose what and how much of that they want to eat. At home, my son has his own drawer in the fridge that is loaded with healthy goodies he loves like; baby carrots, broccoli, cheese sticks, and homemade apple sauce. Being patient with kids and allowing them to help are the best ways to ensure that they learn healthy eating habits. Kids are more likely to try foods that they helped make. But the sad reality of it is that kids don’t always have the options of having fresh fruits and vegetables available to them to just grab and snack on. Many of the families in this class rely on food banks to provide them meals, and often fresh produce isn’t available. More than 16 million children (nearly one in five children in America) struggle with hunger. They live in families that lack the means to regularly put enough nutritious food on the table for everyone to live healthy, active lives. They are considered “food-insecure.” Click here to learn more about Childhood Hunger in America and how you can make a difference. This really hurts my heart. It tares in two, it really does. 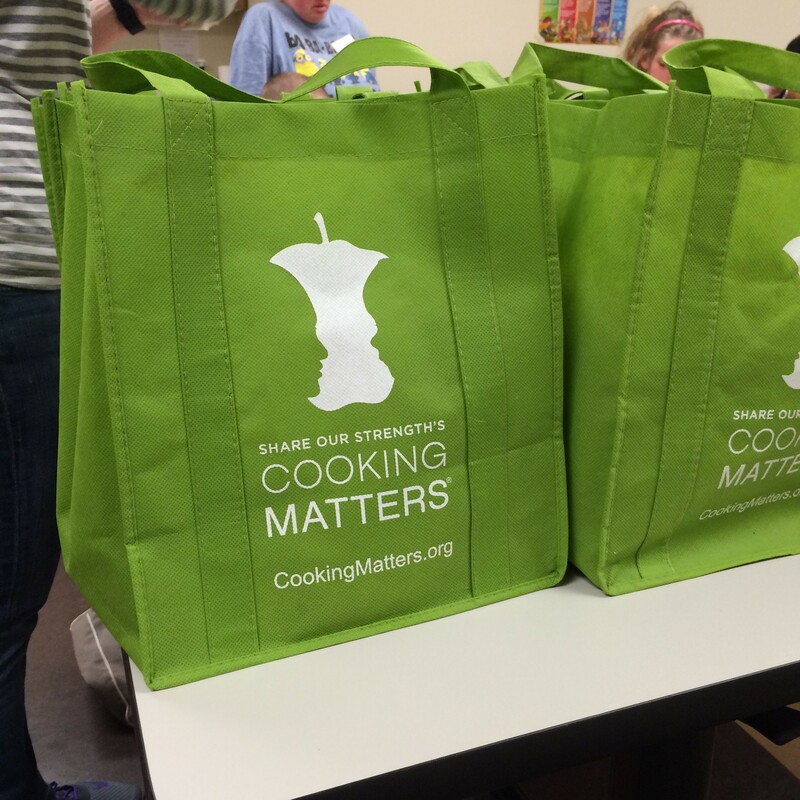 But, I am confident that together we can make a difference, and help feed more families, and I know that these Cooking Matters classes are really giving families and the kids the fundamentals they need to prepare healthy meals at home that include fresh vegetables without spending a lot of money. 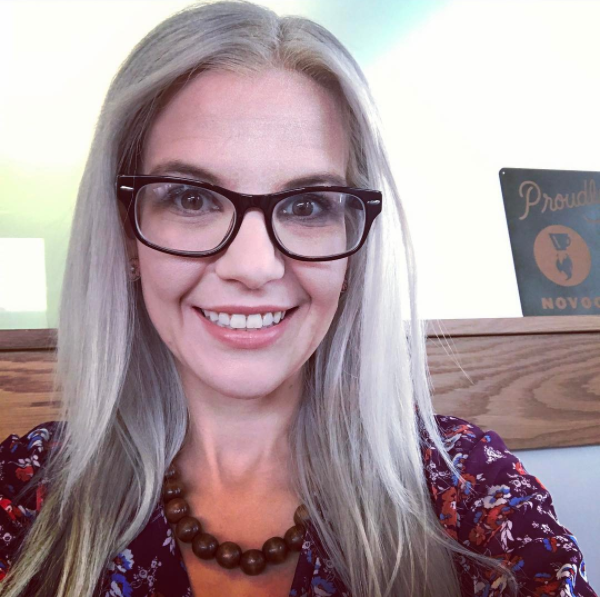 I just hope that I can pass on as much of my knowledge, passion and love for food as I can to these families and help them make a difference at home with healthy eating habits. 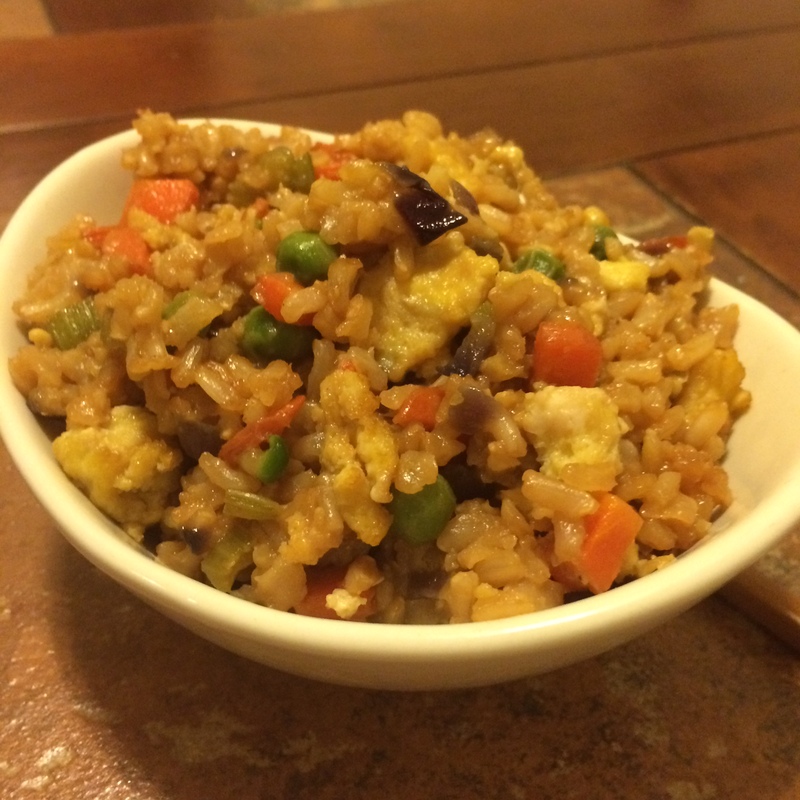 Our recipe for week two is, Easy Vegetable Fried Rice. Going meatless is a fantastic way to save money on groceries. Let’s face it – meat is expensive, and it doesn’t always go as far in a meal as you would like. 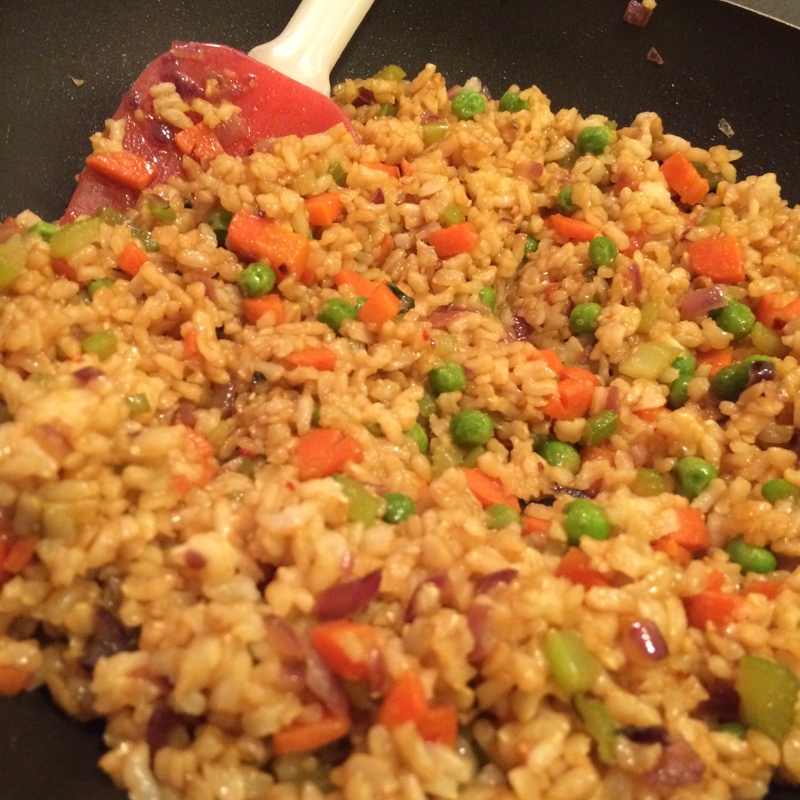 This vegetable fried rice is a great recipe to get kids involved in cooking, because they really can cook almost every aspect of this dish. What really knocks this fried rice out of the park is the subtle sweetness from only 1 tbsp of brown sugar or honey added to the soy sauce! 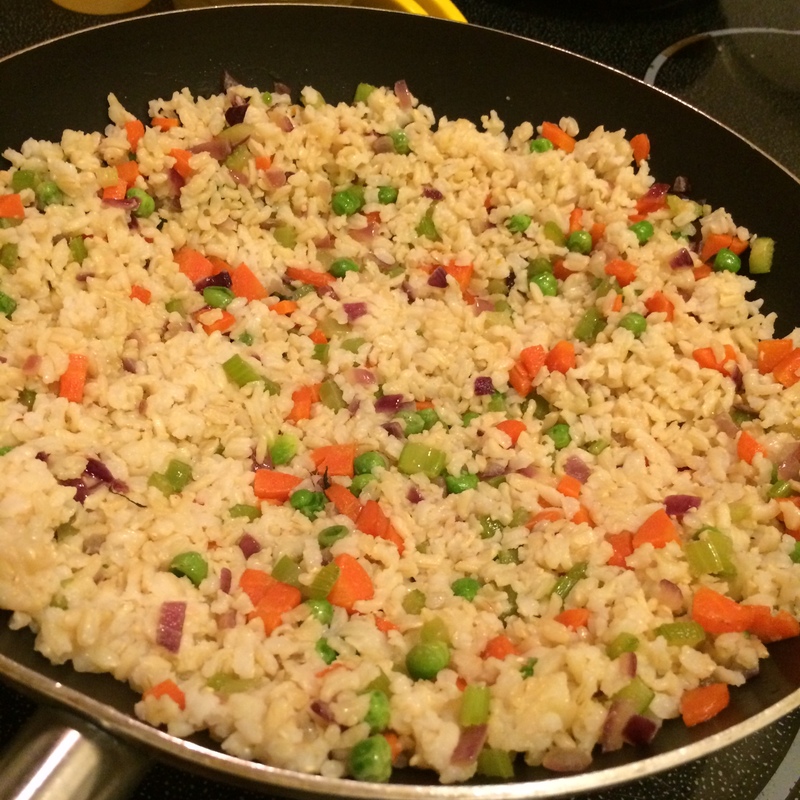 This recipe is for a simple vegetable fried rice, but feel free to add chicken, pork, shrimp, tofu, veggies or any other protein you love! 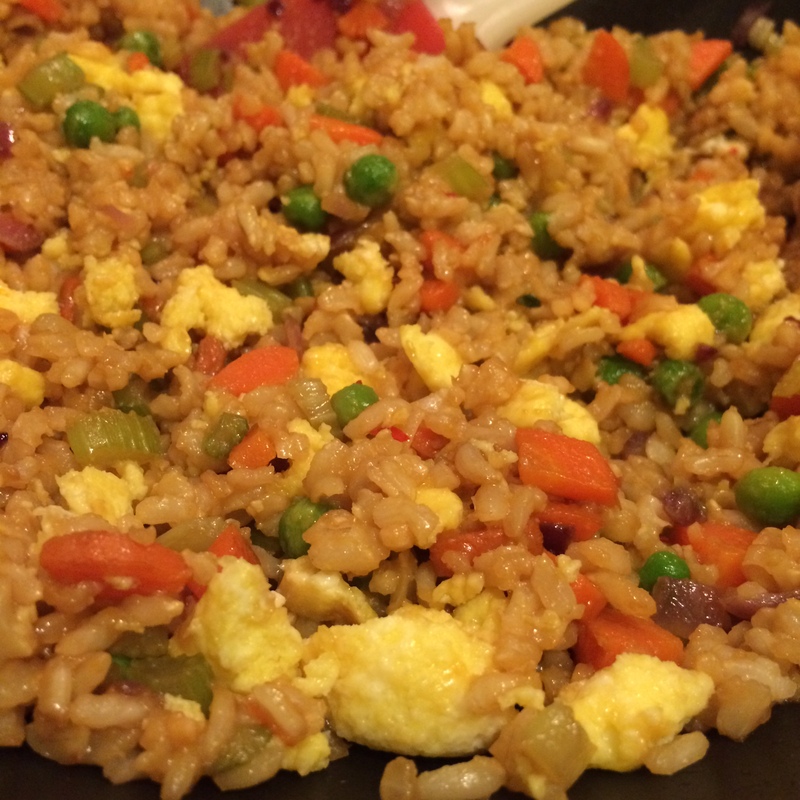 Use cold rice: This is the key to great fried rice. Using cold or leftover rice makes all the difference when it hits the pan. If you don’t have any leftover rice, or any cold, spread the rice you just cooked out on a sheet tray and toss it in the freezer for 10 minutes or so – you don’t want the rice frozen, just chilled. 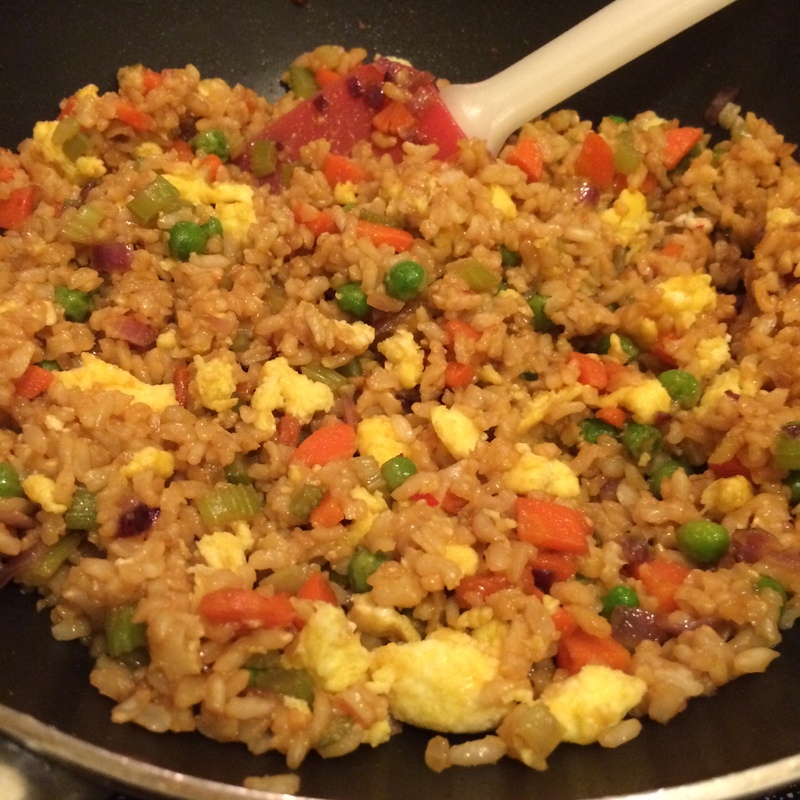 Use butter: There is a reason that the fried rice at a Japanese steakhouse is always absolutely fantastic – and this is because they use A LOT of butter. The butter really makes everything brown up a little bit better, and common.. butter tastes gooooooood! Use lots of vegetables: Whatever your kiddos favorite veggies are, use those, and use lots of them! Vegetables go a long way in stretching out a recipe. I like to use frozen peas and carrots for convenience, and then whatever other vegetables I have around the house like; onion, broccoli or zucchini. But, the options are truly endless – you can add any veggies you want to make it your own. Cook your eggs first: Again, there is a reason that at the Japanese steakhouse, the chefs always cook the eggs first, or on the side, and then mix it into the veggies and rice. This allows for a fluffier egg, and for the egg to be more evenly distributed throughout the dish. If you cook the egg with the rice, chances are it will become gummy, and sticky, and no one will like dinner. Fry the rice: Take your time, and actually fry the rice. 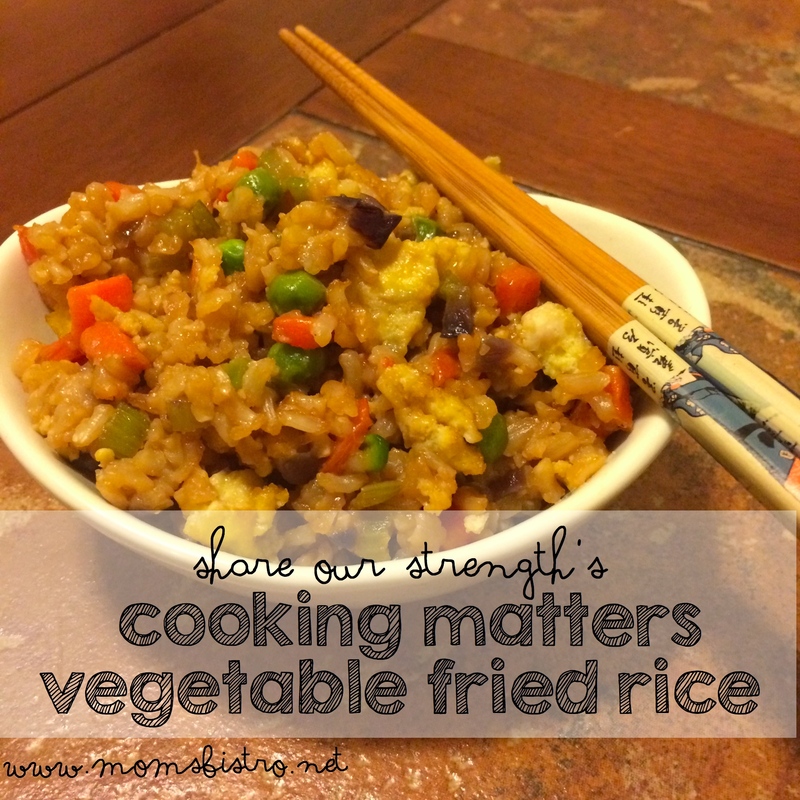 Actually letting your rice “fry” with the vegetables allows it to get crispy. Just like at the Japanese steak house – your rice usually sits on the grill for at least 5-10 minutes while the chef prepares other ingredients – do this at home too, and you won’t be disappointed! This is one of the hardest parts of the recipe – just waiting for the rice to fry! Scramble and cook eggs. Use 1 tbsp butter and cook your eggs first, then set them aside. This is a great step for kids to do, as it will give them practice to cook eggs for breakfast – possibly for mom and dad as breakfast in bed? When cooking scrambled eggs, make sure to crack the eggs in a separate bowl first to make sure they are still good, and to avoid getting shells in your food. Beat eggs with a fork, and season with a pinch of salt and black pepper. Don’t oven season your eggs, because there will still be a lot of salt in the rest of the dish. 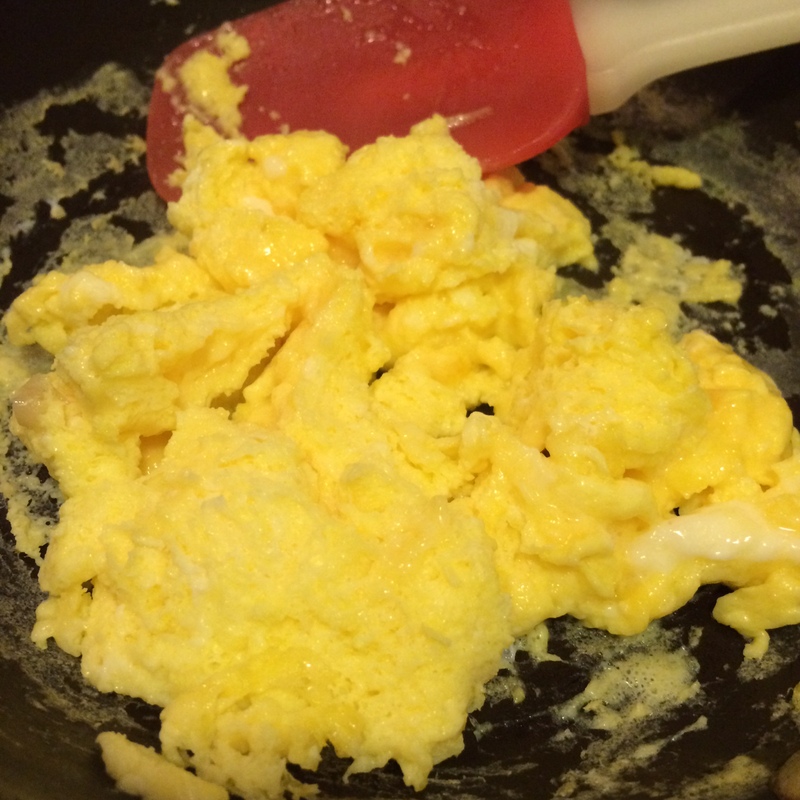 For light and fluffy scrambled eggs, add 1 tbsp butter to a non stick pan and melt. Add eggs and stir once. Leave the eggs, and allow them to cook, until the bottom is kind of bubbly and it almost looks like you’re making an omelet. 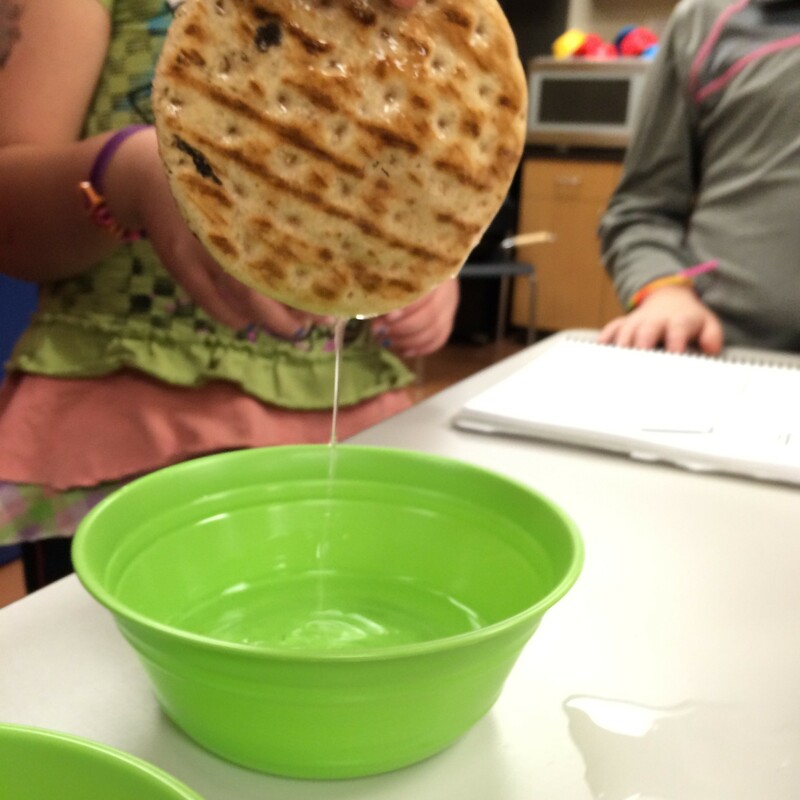 Use a silicone spatula or wooden spoon and give a stir as if scrambling. Lightly fold eggs over themselves until cooked. Rince and chop broccoli, celery, carrots and onions. 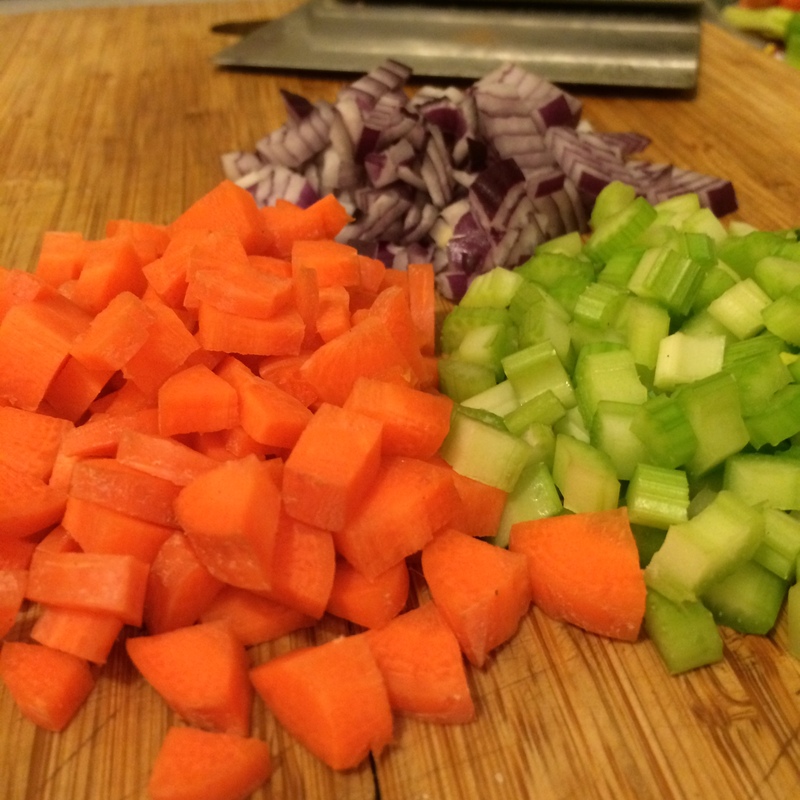 Set all of your chopped veggies in a bowl, or on a cutting board. I didn’t have any broccoli when I made this at home, so in the pictures, you’ll only see onion, carrots, celery and peas. 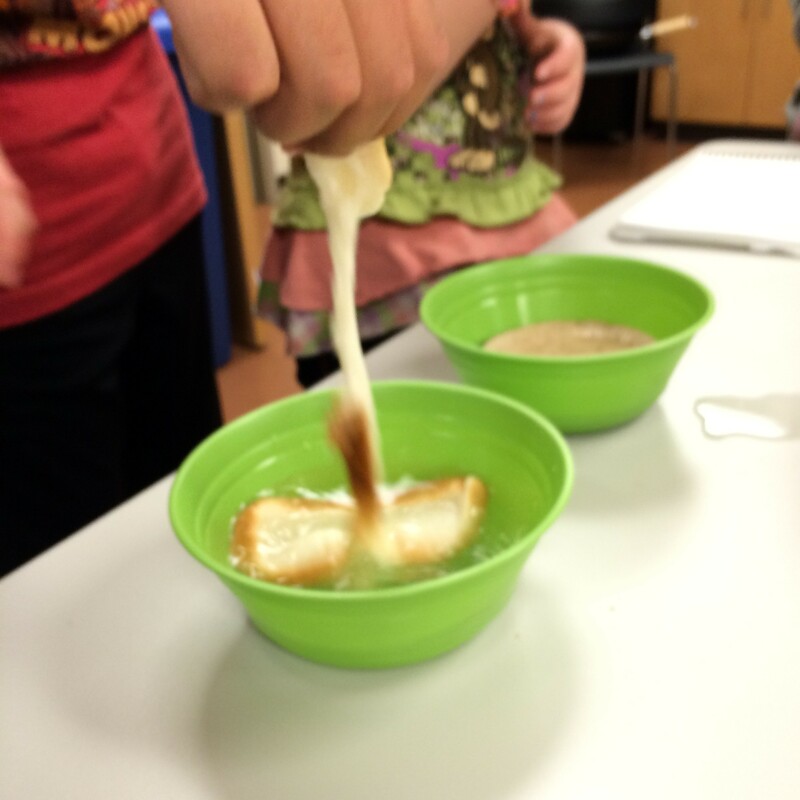 In a small bowl, add ingredients to make sauce, and stir until combined and the ginger and brown sugar are dissolved. 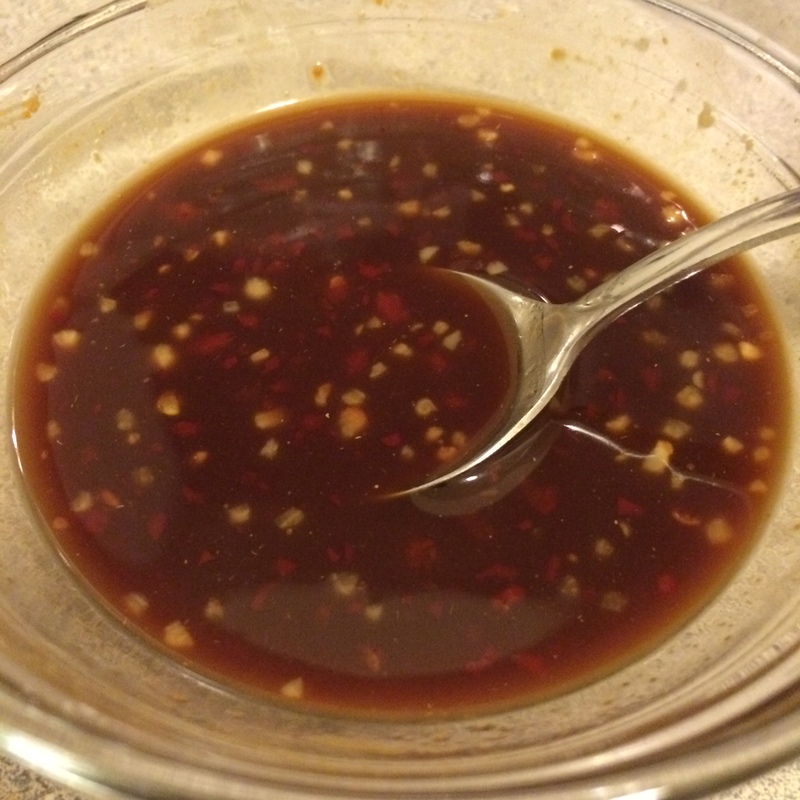 In a medium skillet or wok over medium-high heat, add butter and if you have it, 1 tbsp sesame oil. 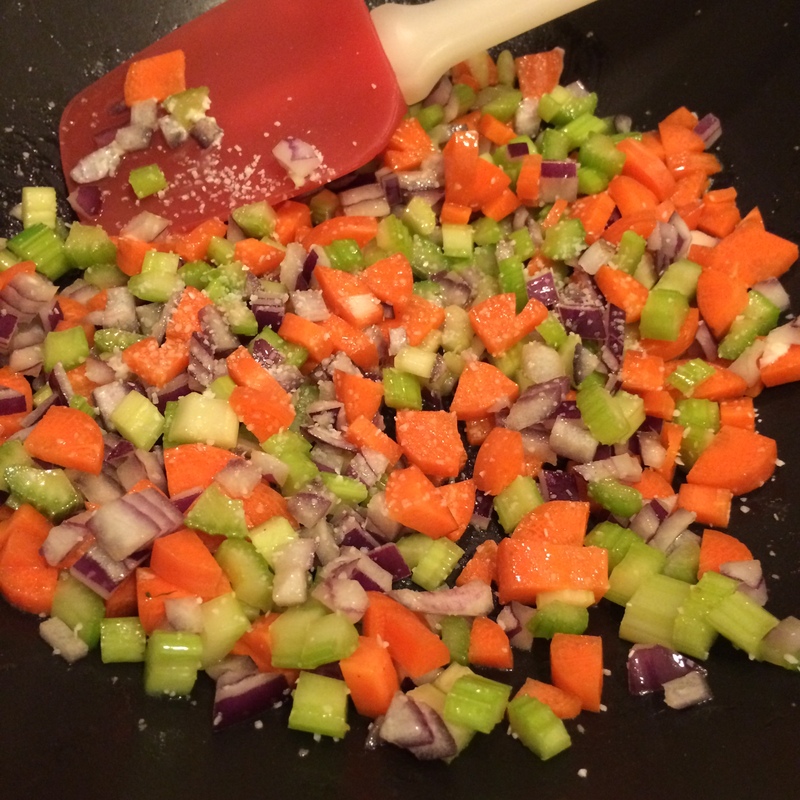 When shimmering add carrots, onion, celery and broccoli. Stirring frequently, cook until veggies are tender and onions are translucent – about 8-10 minutes. 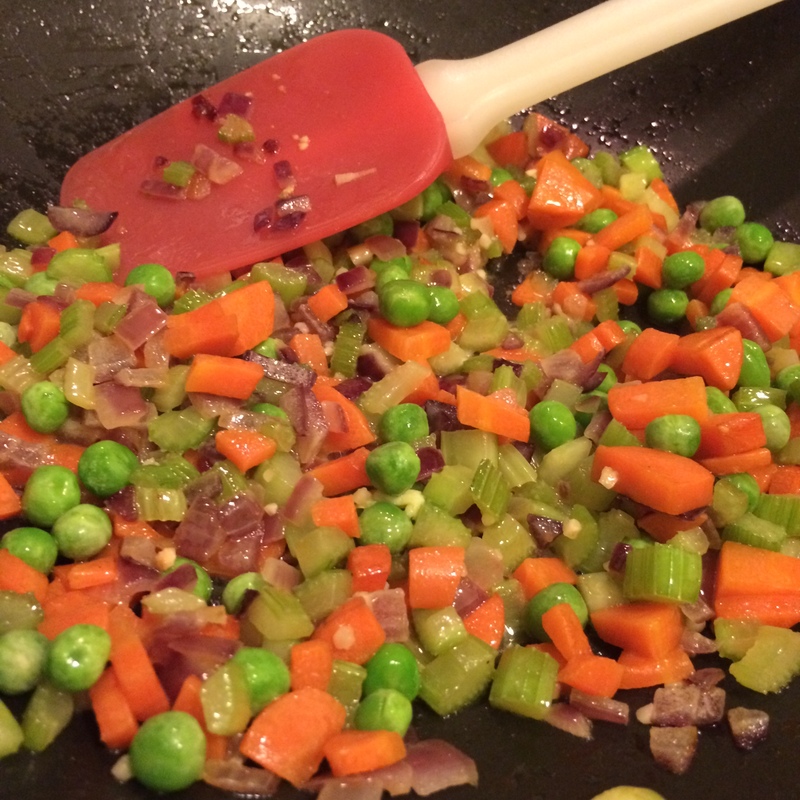 Once your veggies are soft, add frozen peas, and give a good stir to combine. Allow to cook for another 5 minutes, until peas start to shrink a little bit. Add cold rice, and stir to combine. Push the rice and veggie mix down into the pan, to allow the rice to get nice and crispy. Cook for another 5 minutes. This is what I mentioned above about really allowing your rice to fry to turn good fried rice into great fried rice. Add soy sauce mixture. Reduce heat to low and stir until all the rice and vegetables are coated in sauce. Add cooked eggs to rice. Use a wooden spoon and break up the scrambled eggs into rice, and stir until the eggs are evenly distributed through the rice and vegetable mixture. Let it cook for maybe another 30 seconds, to warm the eggs back up. Remove from heat and serve right away. Our family likes to add a little extra soy sauce over the top and some fresh green onions (if we have them) for crunch. That’s it! If you’re a chicken or pork fried rice fan, add it! Cook it on the side, like you did with the egg, and add it into your rice at the same time you add the egg. 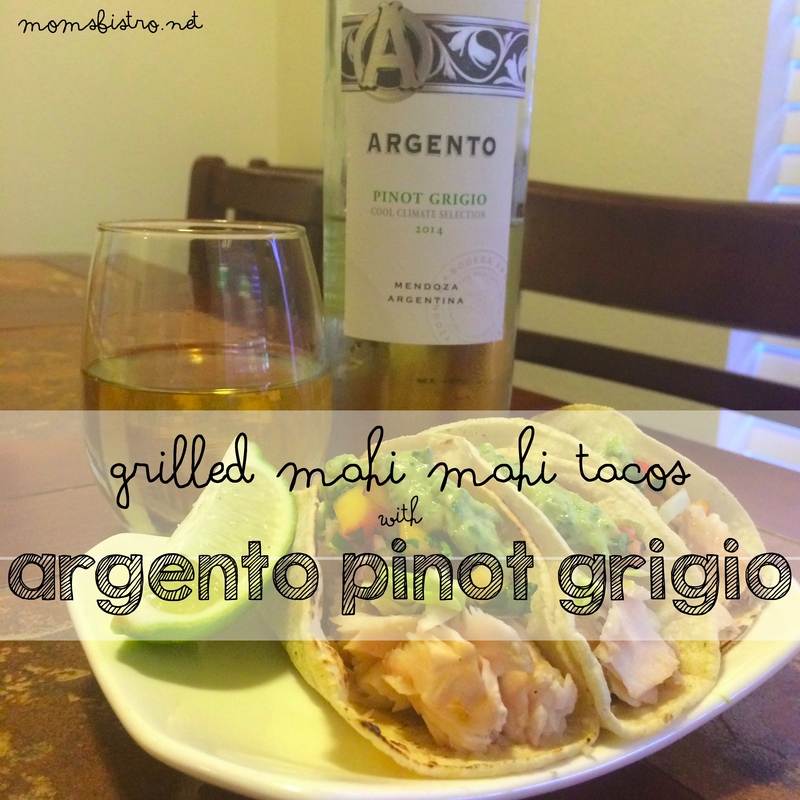 This is a great way to use up leftover meat from another nights dinner. My favorite part about this recipe is that it’s ready in about 30 minutes, which is significantly less time and money than it takes to order in. Tonight was amazing. I am so happy, and grateful that I am a part of this program, and I cannot wait to do more, and get more involved to touch more lives. This class is just so full of energy, and everyone has such great enthusiasm about cooking and learning, its such a great environment. 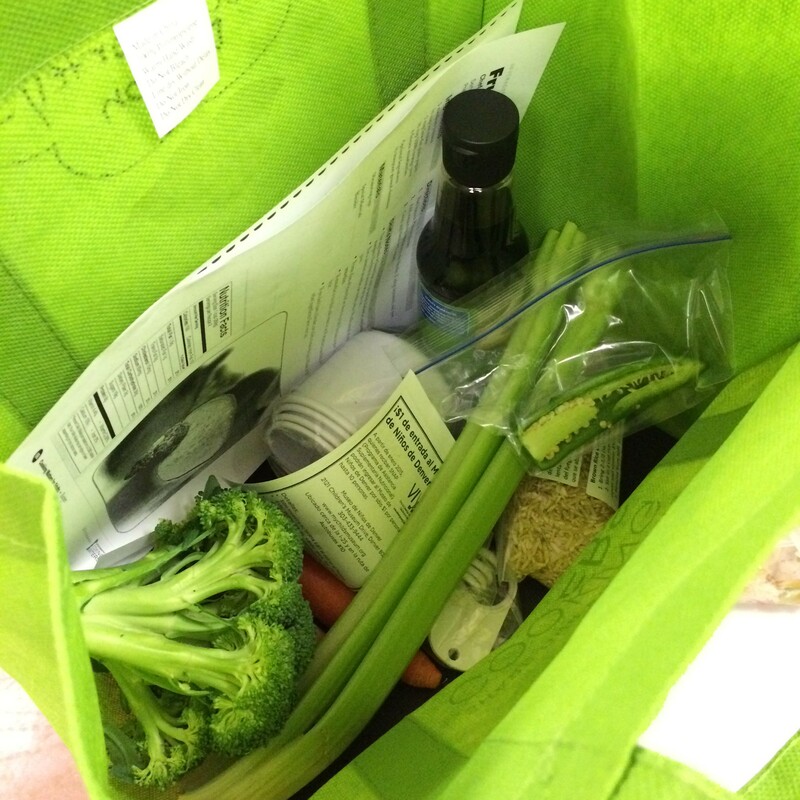 Each week families get to bring home a bag of groceries with them, with the ingredients from the dish we cooked in class. It is their “homework” to go home, and cook the meal we made in class together as a family, and share their experience with us the next week. 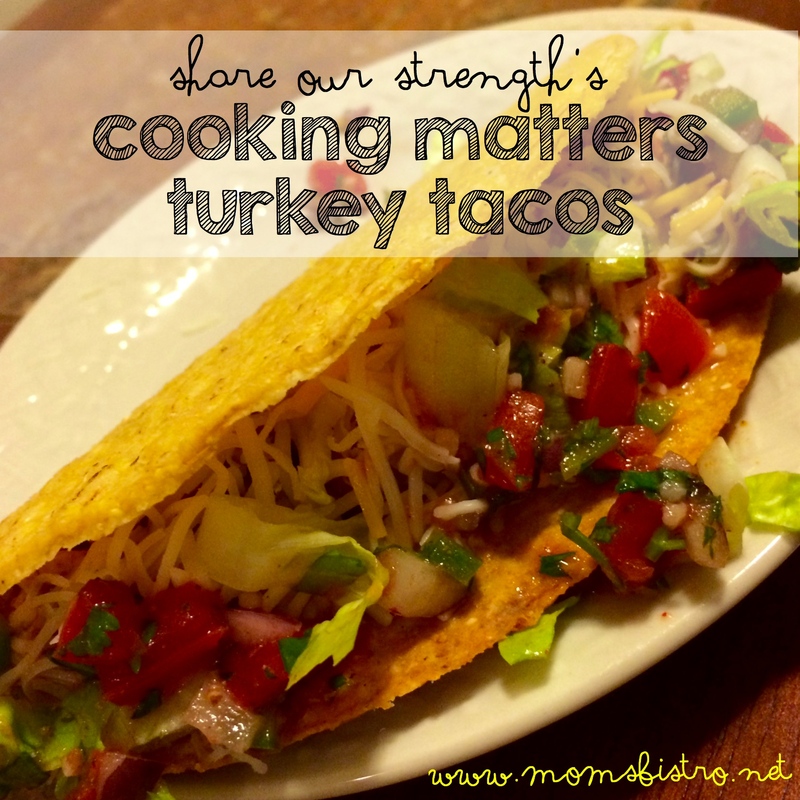 Last week, we had turkey tacos for dinner, and sent the families home with the ingredients. Almost everyone in class did their homework and shared their experience with us. 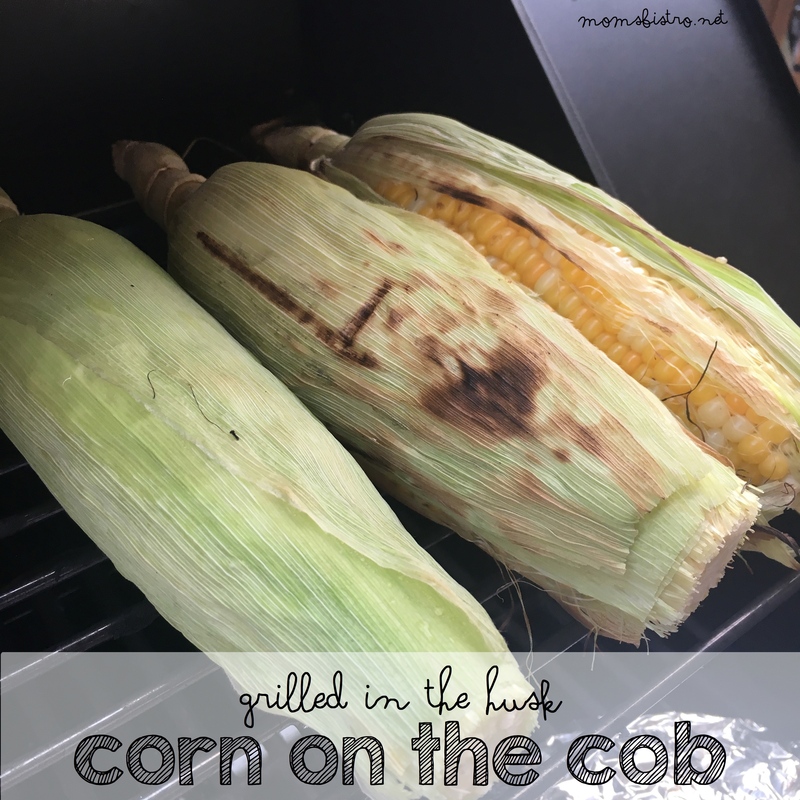 Some families added corn, others added more vegetables, and some left just like it was, but they were all SO EXCITED to share what they learned in the last week, and how they have been practicing the skills we learned in class. Our class tonight started with a taste test. 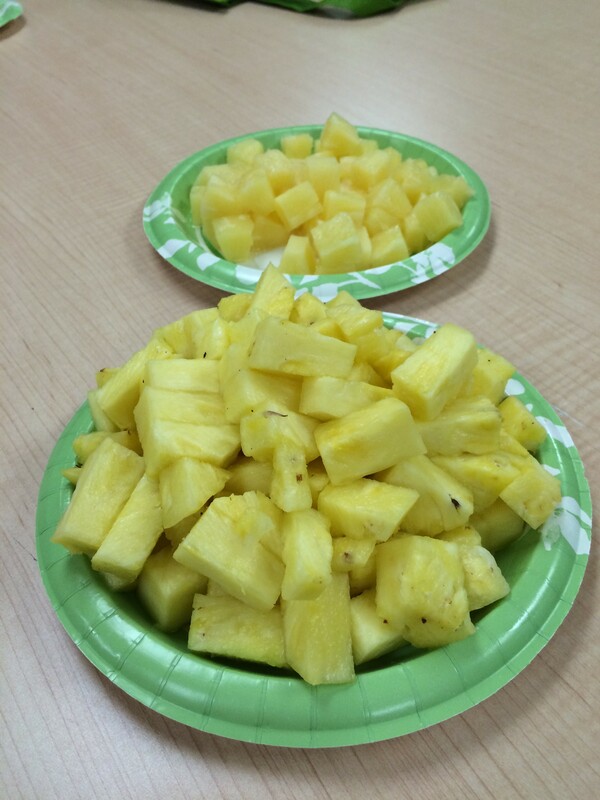 We opened a can of pineapple, sliced and diced a fresh pineapple and then tried two different types of whole grains. We passed the food around the classroom, and asked everyone what they thought of the meals, and to describe to us how it tasted. They just got it! 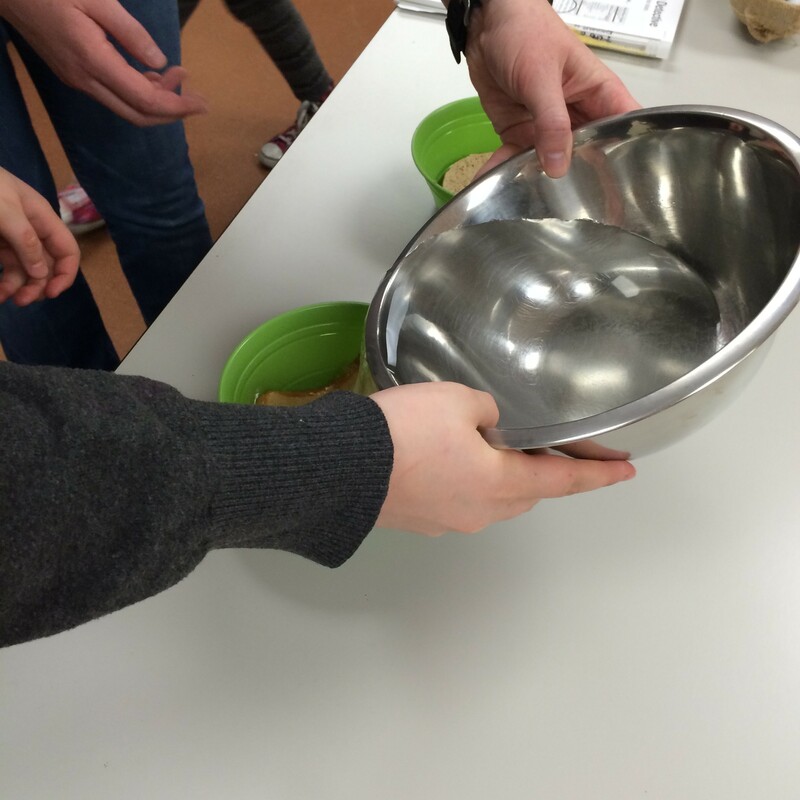 Next was our cooking lesson. In class we cooked the recipe for fried rice a little bit different than the recipe I have, but we used the same ingredients and my god was it ever delicious, and the kids loved every single bite. Our lesson started with a little knife skills demo, and I showed the families how to dice a carrot, and bell pepper. I also planned on demoing how to use a spoon, and peel fresh ginger, but as I was explaining what we were going to do, one of the kids raised his hand, and almost jumped out of his seat to tell me that he knew how to do it, so I had him come up to the front, called him my sous chef and he taught the class how to peel the ginger. Man I wish I got a picture of this! Then we got into cooking. 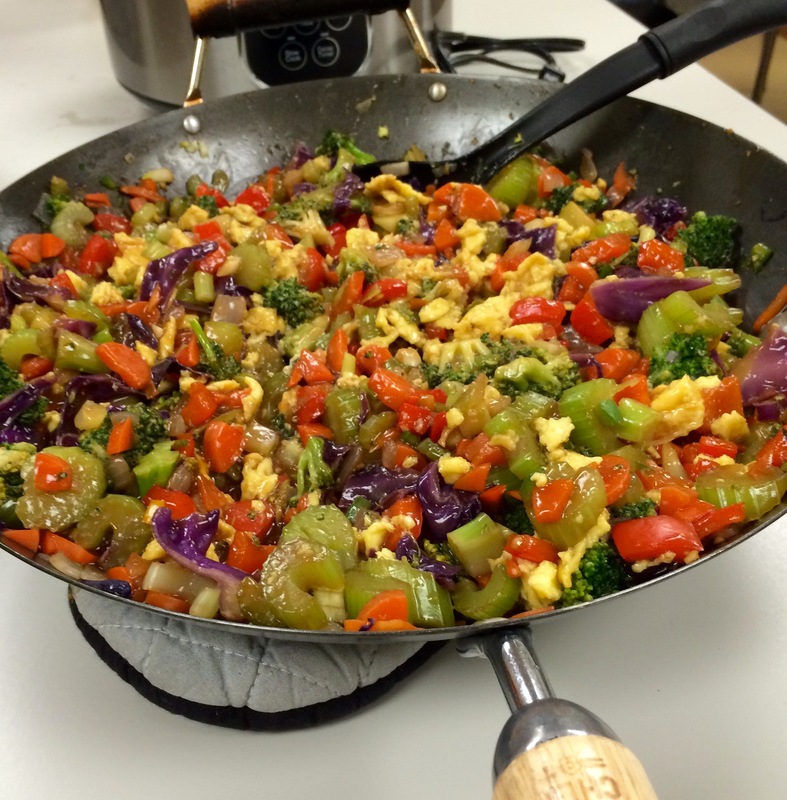 One family was really excited to help, and I had two sisters, crack and scramble the eggs for our fried rice while another family sauteed vegetables and a third family chopped the ginger, garlic and jalapeno and made our delicious sauce that the veggies cooked in. Everyone was so involved, and were having a blast communicating and just being with each other. While some families were cooking the rice, we had a couple other families make everyone smoothies. The smoothies had frozen mixed berries, orange juice, plain yogurt, almond milk, bananas and fresh spinach! 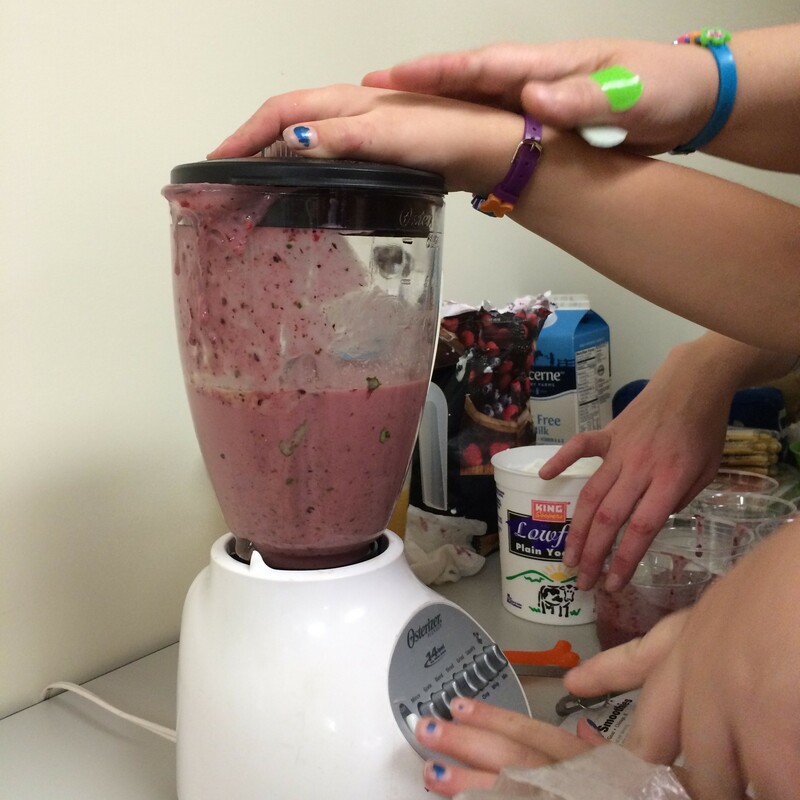 The kids had a great time working with their parents, adding the ingredients and blending the smoothies. After everything was cooked, it was time for families to serve themselves, eat and enjoy an awesome nutrition lesson from Kelly. Tonight, Kelly talked to the class about the importance of reading labels and what to look for on a label. Then she spoke a little bit about fiber and incorporating more into our diets by making better food choices like whole grains and vegetables over processed foods. 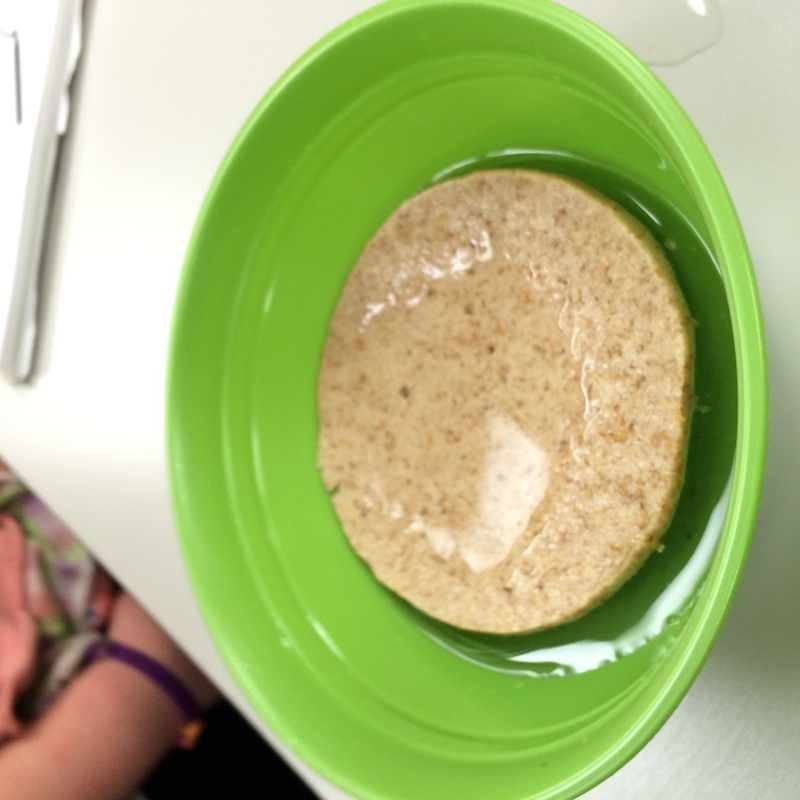 But when the reality of the importance of fiber and how choosing whole grains keeps you fuller longer really hit home when she did a demo of how break brakes down in your stomach. 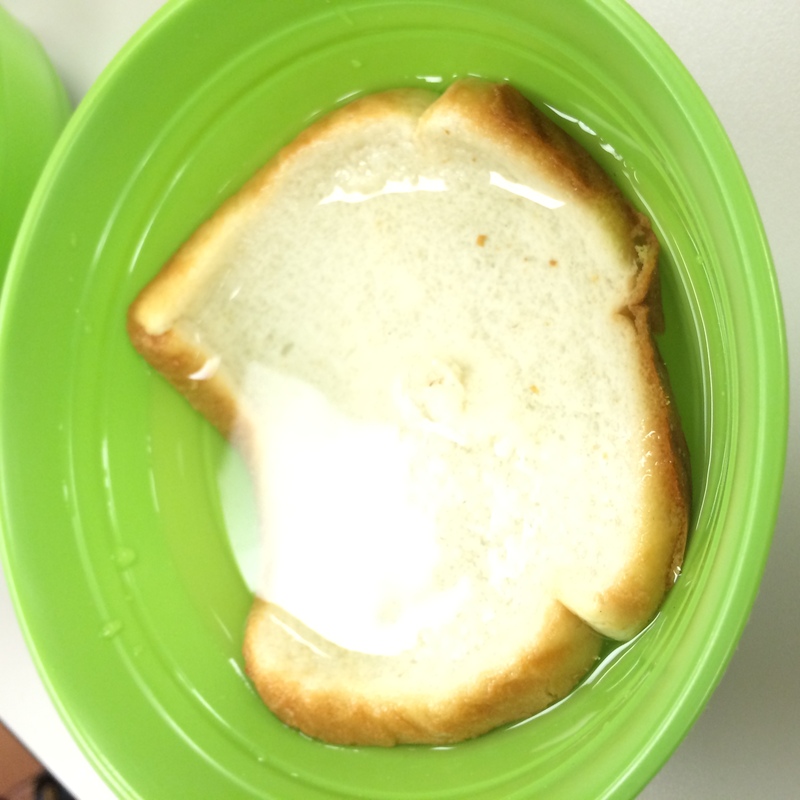 We had two kiddos come up to the front of the classroom, and pour water into bowls with bread. One bowl had white bread, and the other bowl had whole wheat bread. Then we let the bread sit for a couple minutes. And then we had the kids pick up the bread. The kids and parents were grossed out and in shock all at the same time. I think this test really opened their eyes to the difference that whole grains make in a healthy diet. The class ended and I got three hugs, a whole bunch of thank you’s and a high five. I am so excited for next week to see everyone again, and hear about their experience making dinner at home. I just had to comment of this fried recipe. 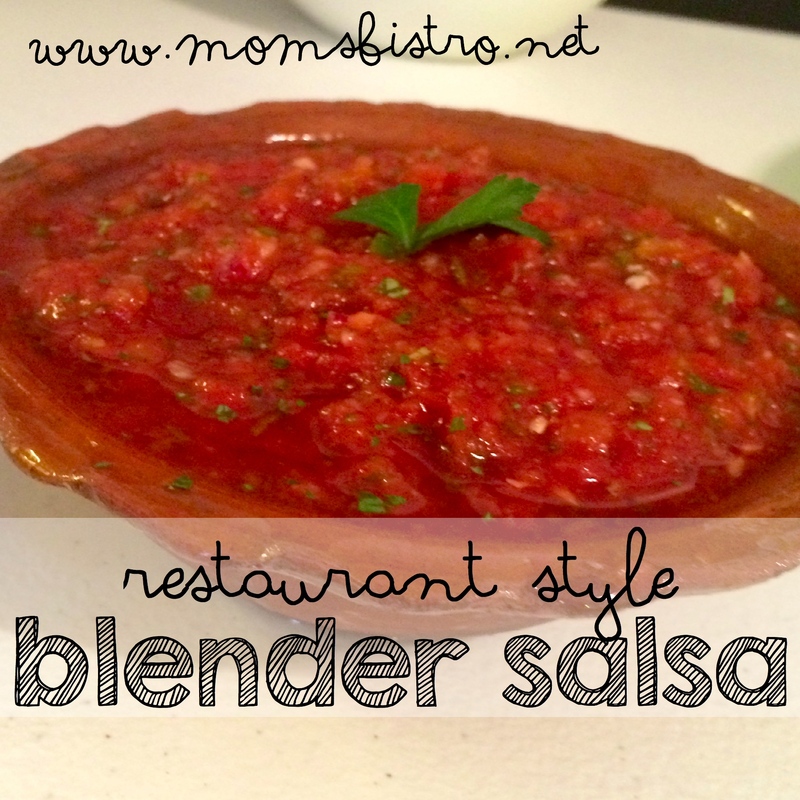 I was skeptical because I have tried several recipes and each time we have been disappointed. My husband is very particular about fried rice and never has mine every compared to our local Japanese Steak house. This one was a hit!! He was begging me to make it again before he was done with the plate in front of him. This is going to become a staple at our house. Thank you so much for sharing. Thank you for sharing! I am so happy your hubby loved it! Is there a PDF version of the Fried Rice recipe? There should be alink at the bottom of the page!